The Osmond Brothers (Wayne, Merrill & Jay) are no strangers to the road. The Osmonds are one of the most well-known entertainment acts in the world. Thir example of an unfailing belief in God and family, along with a wide range of talent, creates the unique combination that has led to the tremendous success of the Osmonds. They've spent over forty years working together as a family and entertaining audiences all over the world, giving them the accomplishment of the longest running group in history. Their spirit of dedication and loyalty to the craft is felt, and reciprocated, by their equally dedicated, and loyal following. It is this same spirit they bring to their many music styles. The Osmond Brothers' career began in "Barbershop" as young boys, and it is that familiar harmonizing that has become the "signature" on their music. They skillfully play 28 musical instruments among them; dance, write music, and create an electricity between stage and audience, that can only be felt during an Osmond performance. The Osmond family has collectively been awarded 47 gold and platinum records. They surpassed both Elvis' and the Beatles' best single year success by being honoured with nine gold records in 1971. 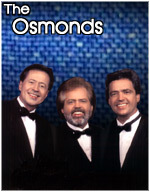 The Osmond Brothers have created a niche all their own in the field of entertainment. Their remarkable success with Pop, Rock & Roll, Country, and Gospel music, has enabled them to touch audiences both young and old, and every age in between. Mastering this variety of musical genres is the major contributing factor in the Osmond's tremendous success in television, recording, and concert performances. Sold-out engagements from Vegas to the U.K. have been synonymous with the name "Osmond" since their early years in the entertainment business. All site contents copyright © 2019 ARB Productions Inc.